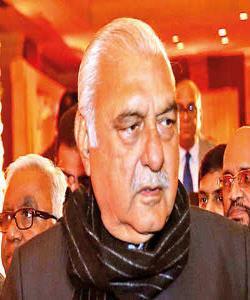 Former Chief Minister of Haryana hooda is disturbed with the latest blame of the wrong allotment of land to Wadra. Sources say, FIR is already lodged and Police approached the government to take action on report against both. In spite of these, Hudda is taking all the possible steps to revive Congress in the state. Sources say Rahul Gandhi has also assured him for a leadership if in case the party comes to power. To continue with his strategy of revival invited some his followers and narrated saying of the party leader to him. After detailed discussions, sources say, supporters opined that Congress never gives chance of leadership to any leader under scanner and under this circumstance it will be difficult for him to claim it, though they will work on booths as decided, but apart from this, one or two persons with pink turban or scarf will also be there to represent him. During cycle Yatra, pink was colour of team. Lets hope that this planning works for the revival of the both.